Supersonic starlet uring the years following World War Two, the United States Air Force (USAF) realised that they had a large fleet of aircraft, many of which were redundant. The emergence of gas-turbine technology made the piston engine obsolete and the application of the jet engine was the only option. Consequently, during the late 1940s the Air Research and Development Command (ARDC) at Wright- Patterson Air Force Base (AFB), Ohio, issued two Generalised Bomber Studies (GEBO I and GEBO II). It was GEBO II, issued in February 1949, that attracted several aircraft manufacturers and bids for the new bomber were submitted by Boeing, Convair, Curtiss, Douglas, Martin and North American Aviation. GEBO II was intended as a replacement for the, as yet un-flown, Boeing B-47 Stratojet. In fact, the B-47 was not replaced by the chosen new design which was later designated B-58. 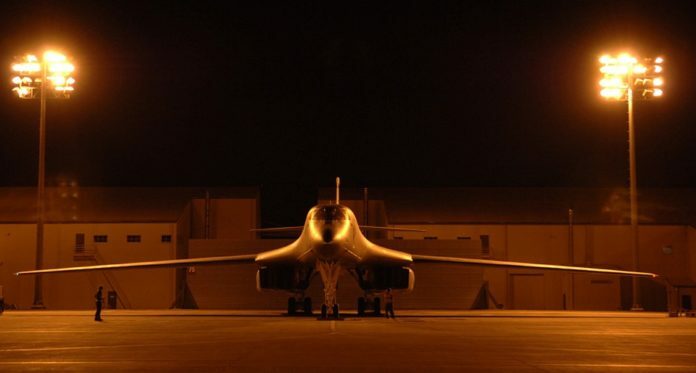 What the USAF wanted was a supersonic bomber that could carry the large and heavy atom bombs of the time over a range of 10,000 miles. In 1949, there were few aircraft capable of flying at supersonic speed for more than a few hundred miles. Engines were also a problem as, at the time, there was none that could power the proposed heavy aircraft. General- Electric had been experimenting with rocket motors and ramjets, or combination turbojet and rocket boosters for some time. They were also developing a new turbojet, the after-burning X-24A with variable incidence stator blades and this appeared to be the answer. Produced as the J79 turbojet it developed 15,600lb of thrust with the afterburners operational. This immediately gave the GEBO II programme the engine it needed. At one stage, the USAF considered making the GEBO II a parasite aircraft to be carried aloft underneath a Convair B-36. Once at altitude it would be launched on its mission and re-attached for the return journey. Following initial discussions the design proposal was shown to be flawed and fraught with problems; it was not proceeded with. The Convair designers, under Robert Widmer, developed a series of proposals for GEBO II, which studied swept-wing, semi-delta and full delta planforms. An early concept drawing shows a full delta-winged twin-engined aircraft with each powerplant integrated into the wing. Two crew positions were specified and a jettisonable pod for weapons and fuel was designed to form an integral part of the lower fuselage. This idea was something that Widmer had nurtured from very early on in the design studies. If he had designed an aircraft with an internal bomb load it would have to be large, possibly the size of the B-36 and that would not be capable of supersonic flight with the engine technology of the time, so he developed the external and disposable pod to fit under the fuselage of the aircraft. Given the programme designation MX-1626, Convair had been considering the delta wingplan for some time and design studies led to the XF-92A fighter concept. This in turn fielded the delta-winged F-102 and F-106 fighters that later entered USAF service. Convair was in an excellent position to address the request from the USAF, as independently Robert Widmer had started investigating the possibility of developing a supersonic bomber as early as 1947. Working for the Consol idated Vultee Aircraft Corporation (later Convair), Widmer was told to lay-off the supersonic bomber idea and to concentrate on current projects, such as the B-36, but in his own time he had worked on the supersonic bomber design. Later, Widmer would go on to work on the F-111 and F-16; he also developed the Tomahawk missile and worked on Unmanned Aerial Vehicles for the military, some of which went into production and entered operational service. Nuclear bombs of the time were not small; the standard 7,500lb Mk 15 device was nearly 12ft in length and had a diameter of 3ft. This meant the thin fuselage design proposed by Convair produced some engineering issues early on, as it prevented internal carriage of bombs and the required amount of fuel to power the four turbojet engines and allow for any reasonable operating radius to be achieved. As a result, the lower integral fuselage section that had appeared in early designs gave way to a large external droppable two-component pod which was designed to be attached to the underside of the fuselage. Convair redesigned the twin-jet bomber as a four-jet with the engines mounted side-by-side in two pods mounted flush under each delta wing. The separate jettisonable lower fuselage weapons/fuel pod was also featured. Another brochure drawing shows a four-engine delta wing concept with the inner engines carried on pylons under the wing and the outer engines mounted on top of the wing. The weapons-fuel pod had small wings and an inverted fin which would have deployed on release. Interestingly, Boeing’s submission for GEBO II was a four-engined B-47-influenced design with a high mounted swept-back wing carrying the podded engines in the manner of the Stratojet. It did not progress beyond the wind tunnel model stage. By 1951 several design brochures had been submitted to the USAF for consideration and it looked like Boeing would be the front runner. However, their Model 484 was rejected as it only had an estimated top speed of Mach 1.3 and the USAF was looking for a Mach 2 bomber. Curtiss, Martin and North American Aviation all failed to impress with their designs and were dismissed early in the programme. Douglas proposed their twin-engined bomber, with the USAF programme MX-2091 label, but it failed to meet GEBO II on several levels, including its top speed which fell short of Mach One. Convair invested heavily in the programme and several full- and half-size models were built to study the crew positions, weapons pod and engine layout. Similar to the problems faced by Boeing when they were developing the B-47, Convair also experienced difficulties with the ideal positioning of the ^ engine pods in relation to ‘*щ windflow. Many months v were occupied with wind tunnel tests to get the design right. To smooth the fuselage, airflow canards were installed on one model and this was tried out but soon rejected. At this stage, engines were still mounted as twins in pods underneath the delta-wing. Engine pylon design and heights were varied, nacelle lengths were changed and powerplants altered. The one constant in the evolving aircraft was the delta-wing planform. From the earliest drawings this remained largely unaltered, as the design, models and mock-ups progressed. The Convair MX-1626, now coded FZP-110, was still a two-crew, delta-wing design but with General Electric J53 engines specified and performance estimated at 1,000mph with a 3,000-mile range. Boeing and Convair were chosen to proceed with a Phase One study. However, as the months rolled by, the USAF requirements had altered and Boeing went out of the frame to concentrate on the B-52 Stratofortress while Convair submitted a developed MX-1626 as the MX-1964. This design still had the four engines flush-mounted, two each side-by-side under the wings. It also depicted a powered weapons pod but this was not proceeded with beyond exploratory drawings. Models of the various MX-1626 and MX-1964 designs were subjected to an evaluation programme by the USAF and hours of wind tunnel testing were carried out. The Air Force even looked at the possibility of making the bomber capable of carrying a parasite fighter, but this was soon dismissed. In December 1952, the Air Force selected the MX-1964 for Weapons System 102 (WS102) as the winner of the design competition to meet the newly proposed SAB-51 (Supersonic Aircraft Bomber) and SAR-51 (Supersonic Aircraft Reconnaissance), the first General Operational Requirement (GOR) worldwide for supersonic bombers. In February 1953, the Air Force issued a contract for development of Convair’s design. By now the MX-1964 was looking more like the final design with four engines hanging under the wing on four separate pylons; the USAF had designated the design as the B-58 and stipulated the use of the new General Electric J79-GE-1 turbojet engine as standard. The delta-wing was given a leading-edge sweep of sixty degrees and Mach Two was guaranteed by Convair. Because it was designed to fly at twice the speed of sound, special consideration was given to supersonic aerodynam ics when designing the aircraft and the ‘Area Rule’ was applied. The Area Rule governs the basic shape of the aircraft and states (very approximately) that the cross sectional area should remain constant. This is most obvious in the thin ‘wasp waist’ of most high-performance aircraft fuselages where the wing is joined. On the B-58, the engine nacelles were factored in and this explains why the inboard engines project far out in front of the wing leading edge. The fuselage mounted pods, which were designed to carry additional fuel and (nuclear) weapons, were also designed using the Area Rule. Design requirements for the weapons-fuel pod changed constantly and by the time the GOR was issued the pod had been made shorter and fitted snugly beneath the fuselage aft of the nosewheel development of Convair’s design. By now the MX-1964 was looking more like the final design with four engines hanging under the wing on four separate pylons; the USAF had designated the design as the B-58 and stipulated the use of the new General Electric J79-GE-1 turbojet engine as standard. The delta-wing was given a leading-edge sweep of sixty degrees and Mach Two was guaranteed by Convair. Because it was designed to fly at twice the speed of sound, special consideration was given to supersonic aerodynam ics when designing the aircraft and the ‘Area Rule’ was applied. The Area Rule governs the basic shape of the aircraft and states (very approximately) that the cross sectional area should remain constant. This is most obvious in the thin ‘wasp waist’ of most high-performance aircraft fuselages where the wing is joined. On the B-58, the engine nacelles were factored in and this explains why the inboard engines project far out in front of the wing leading edge. The fuselage mounted pods, which were designed to carry additional fuel and (nuclear) weapons, were also designed using the Area Rule. Design requirements for the weapons-fuel pod changed constantly and by the time the GOR was issued the pod had been made shorter and fitted snugly beneath the fuselage aft of the nosewheel i = 1 . Contract for 13 aircraft, two (X)B-58s and eleven YB-58As, was issued in October 1954, with the first prototype to be ready for flight testing within two years. Convair had experience with the delta wing fighters but these were small when compared with the (X) г B-58, so build structures were quite different. The B-58 was one of the first to make extensive use of aluminium honeycomb panels, which bonded inner and outer aluminium skins to honeycomb of aluminium and fibreglass. The stainless-steel honeycomb construction was new technology and the bonding of aluminium skins to the structure to cope with the heat generated at high speeds gave the design team a real challenge. An aircraft travelling at Mach 2 generates a tremendous amount of heat due to air friction. The limiting skin temperature, according to the Convair manual, is 115°C but in exceptional circumstances the B-58 could accept a temperature of 125°C. Skin temperature gauges monitored the vital temperature tolerances. Because of the construction of the wings, the higher temperatures could cause the skins to unbind and keeping a close eye on the gauges was most important. Additionally, because of the heat generated at Mach 2 cruise, not only the crew compartment, but the wheel wells and electronics bay were pressurised and air conditioned.